If you happen to have a nice oven-proof serving platter available, I would encourage you to serve the whole fish tableside straight from the oven. 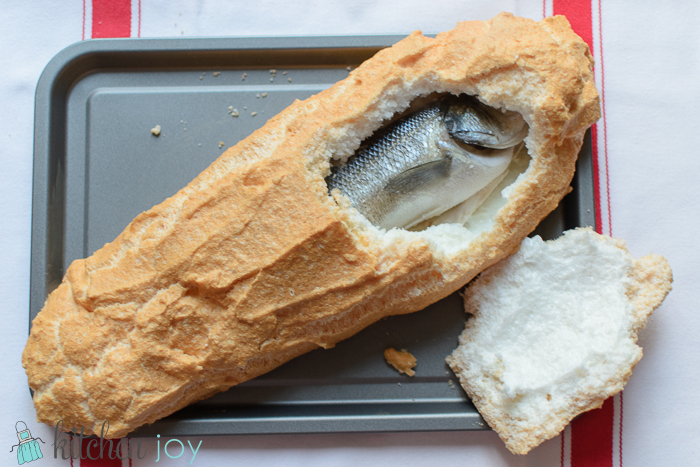 It’s fun to watch the crust being cracked open, exposing the perfectly cooked fish. Word of warning though: Have a spare plate available for the pieces of the salt crust as you remove them or you’ll have a mess on your hands. 1. Use Kosher Salt. If you absolutely cannot find Kosher salt, you can use Sea Salt, but it must be coarse ground. Do not use table salt. I cannot stress that enough. You will ruin your fish. No. Table. Salt. Ever. 2. If you choose to remove the fins, leave just a little bit of the fin behind so that you don’t accidentally penetrate the skin, allowing the salt crust to reach the meat. You can also just opt to leave the fins on, which we often do. To each their own. 3. 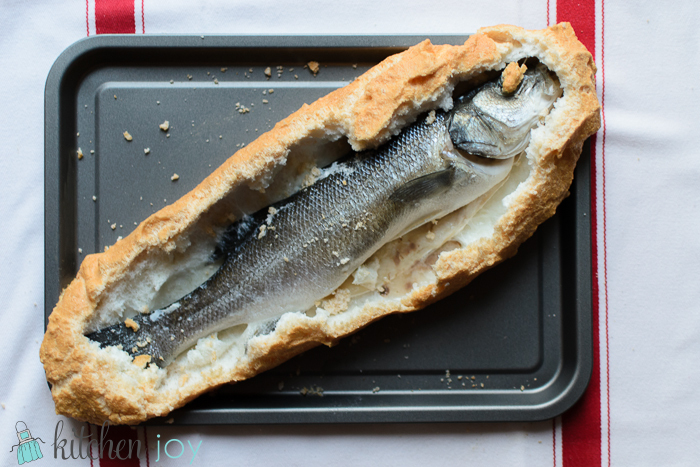 Be sure to bake the fish long enough, and not spread your salt mixture too thick. You want the salt crust to be a deep, golden brown color, being careful not to allow the crust to scorch. You need the egg white to cook through and not still be liquid on the inside at the end of the baking time. The trick is to have the egg white/salt mixture covering the fish completely on all sides so that it seals in the moisture and allows the fish to steam inside of the crust. You also don’t want to spread it on so thick that it doesn’t cook through. If it hasn’t cooked through completely, the remaining uncooked egg white/salt mixture could cause the fish to taste too salty. I usually try to spread it 1/2-3/4 inches thick, but not more than that if possible. If you are able to have the fish cleaned and gutted when you purchase it, I would encourage you to take advantage of that. If not, you can refer to my Risotto with Branzino post to read about about selecting, cleaning and gutting a whole fish. In a large bow, beat 4 large egg whites until stiff peaks form. Fold in 2 cups of coarse grain Kosher salt. On a rimmed baking sheet or oven-proof serving platter, spread about 1/2 cup of the salt mixture. Lay whole fish on top, then completely cover the fish with the remaining salt/egg mixture, spreading about 1/2- to 3/4-inches thick. Bake 25-30 minutes until salt crust is golden. Crack open the shell and remove fish. Serve with good olive oil and lemon.